Heissatopia: Smart phones. Smart me. I forgot my pump when I walked out the door to go to church this morning. Technically, I remembered the pump but forgot everything else—bottles, flanges, diaphragms and valves. In order to pump I need to have all of the above, not some of the above but, unfortunately, some was all I had so I couldn't pump. Not pumping can be devastating for me. It's uncomfortable, first of all, and, second of all, it can be embarrassing. But I was wearing a few layers and my top layer doesn't really show wetness so I figured it would be okay to wait until I got home from church to pump. It would have to be okay. Still, I was sad about forgetting my pump so I took out my phone to text Andrew that I forgot it and when I did that I saw that the last person I had been texting with was our good friend Steve. "When did I text Steve?" I wondered as I clicked on his name to re-read our conversation. Had he texted me and I missed reading it? 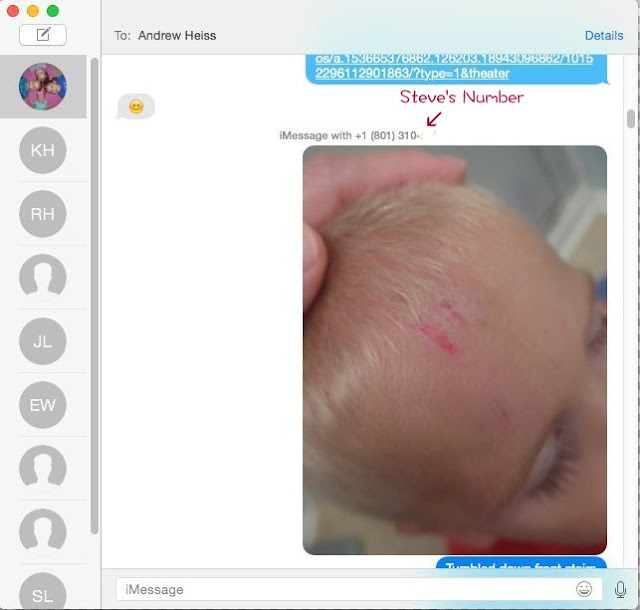 I didn't remember texting him...so imagine my surprise when the conversation I thought I'd had with Andrew (regarding Benjamin's poor little noggin) popped up on the screen. Re-reading this conversation was hilarious considering Steve is...a doctor! Adding to the embarrassment is that I then got on Facebook and fished for medical advice again. I probably wouldn't have done that had I known I'd been talking to a doctor in the first place...but I thought I was talking to my husband who doesn't handle injuries with much aplomb (which is why I figured he was googling first aid). Still, though, the question of how, exactly, I'd managed to text Steve remained. The contacts in my phone are listed alphabetically by last name, so Andrew and Steve are pretty close together (Steve is at the end of my G list and Andrew is at the top of my H list) but I hadn't used my phone to text Andrew Steve. I had used my computer, so when we got back home I checked my computer to see if I had an open conversation with Steve. I didn't. I had an open conversation with Andrew—the very same one that is filed under Steve's name on my phone. Then Andrew noticed that the phone number was different. 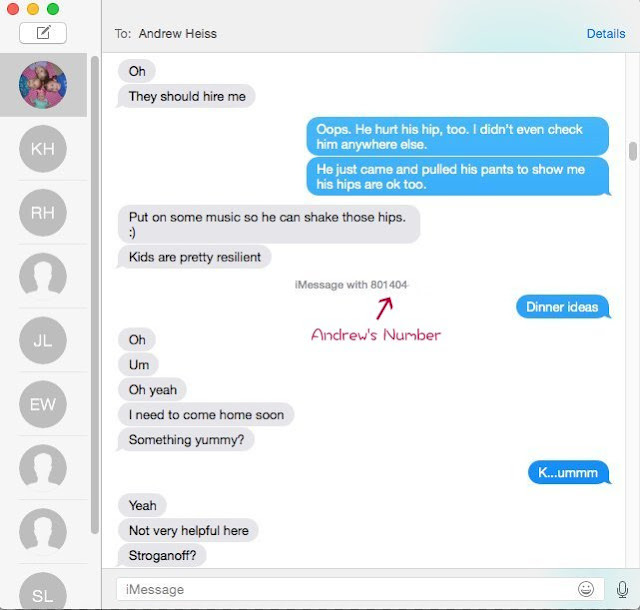 When I uploaded the picture to the chat window, my computer decided to direct it to an old number I had listed for Andrew (rather than Andrew's current number). That old number of Andrew's is Steve's current phone number, so that's how I texted Steve—completely by accident! See, when we moved to Jordan...in 2006 (or was it Egypt...in 2008? )...our phones got juggled around. Karen had a family plan and we didn't want to lose our spots on the plan so James Gillespie (I think...unless it went directly to Steve) took over for Andrew and my dad (or Emily...) took over my phone. 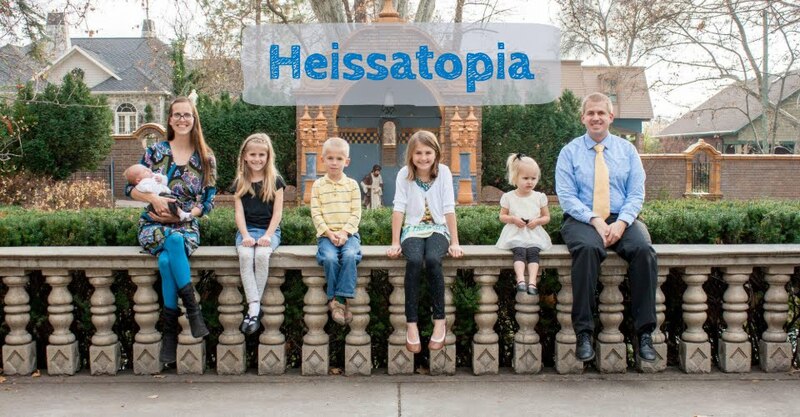 Both people inherited our phone numbers. When we got back from Jordan (or Egypt) Andrew and I got new phones (still on the family plan) and...anyway, now my dad has my old phone number and apparently Steve still has Andrew's old phone number and for whatever reason that number was listed under Andrew's contact information as an alternative number. That's fixed now, so hopefully I won't accidentally text Steve again. I couldn't understand why he was being so unsupportive. No rush to come to my aid, he, in fact, came home later than usual—and I was at home dealing with two screaming babies and a whole lot of blood! And, as far as I knew, he knew that! He couldn't even come up with a dinner idea or anything?! I had to take care of the blood and the screaming and the homework and still manage to make dinner. * Not that we're keeping score or anything but.... Uh-huh. Yeah. Okay, buddy. Thanks for nothing. And then he had the nerve to walk into the house and say, "What happened to Benjamin?" "He fell down the stairs," I said in what was, perhaps, not my most patient voice. "I told you that." 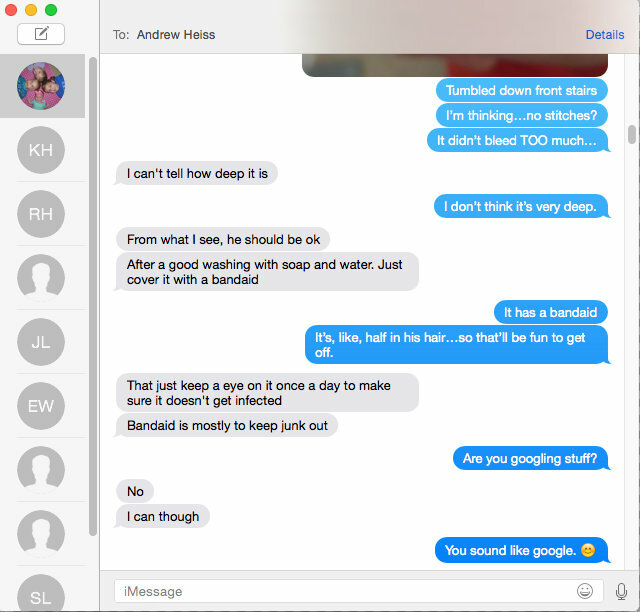 So Andrew was left wondering why I was so put out with him and Steve, meanwhile, was left wondering why I took his medical advice so lightly and accused him of googling first aid instructions for me (I texted him when I realized my mistake and I think he had a good laugh about the whole mess, too). Was this was some strange answer to one of the silent prayers I uttered as I was mopping blood off Benjamin's forehead (head wounds—I tell you! They bleed a lot)? God moves in a mysterious way, after all, and Heavenly Father knew that I needed to feel calm about Benjamin's head so that I could take care of everything else I had going on (ie. three other children) so perhaps that's why the computer switched to Andrew's "other" phone number (which happened to be Steve's current number). If it was, the answer went way over my head; I didn't get it at all! It's either that or technology is simply out to get me because this has happened to me before—phones switching contacts on me, I mean. When I was pumping gallons and gallons of milk for Benjamin and storing them in my mom's freezer, Andrew and I left Karen's family plan and switched to my mom's corporate plan (but kept our same phone numbers). We had smart phones for the first time and my phone downloaded all my contacts from Facebook that had their numbers public, which meant I had a lot of duplicate phone numbers in my phone (because it also downloaded information from Gmail and other places). Then my phone wanted to merge contacts and since I had a billion contacts in my phone and wanted to thing those out, I told my phone to go ahead and do its thing—it was a smart phone, after all. So I merged all my contacts. Unfortunately, my phone merged the contact information for my friend David Layton** with my brother David Layton, so when I phoned David Layton my brother and he didn't answer his phone I left a long, blubbering message about needing to get into Mom's house with a bag of milk to put in the freezer but I couldn't remember the code for the spare key and we had to be at the hospital by a certain time or we'd miss Benjamin's cares and I wouldn't get to hold him that and no one was answering their phones and it was all so frustrating! Turns out, though, that the long blubbering message meant for my brother was actually left on my friend's answering machine. He called back to make sure I was okay because he couldn't understand half the message and was worried about me (I cried a lot when Benjamin was in the NICU, okay?) but that just made me even more embarrassed. But I eventually got over it. * To his credit he eventually suggested (and ended up making) stroganoff; I didn't even thaw the meat for him when he asked me to (kind of; he said I didn't have to if I didn't feel like touching raw meat, and I didn't because I felt like I had touched enough blood for one day, thank you very much). ** Actually, he was my choir director when I was in Russian choir. People thought we were married for a time because we share a last name but he's not exactly attracted to women so we definitely weren't an item in any form. And I didn't even know I had his phone number; my phone just grabbed it from Facebook. Thanks, phone. Way to be smart! Oh, that bit when you asked if he were googling first aid advice is THE BEST. Knowing that he's a doctor now, that is. Hahahahahaaaa. I know! I was laughing so hard! I've been giggling all evening over this! Some days you go all prolific on me, and I am afraid I will miss something! I am so glad I didn't miss THIS! So funny! I find this all very hilarious!